Throughout US history, presidential candidates have always shaken hands at the beginning of their debates. Sunday night history changed. 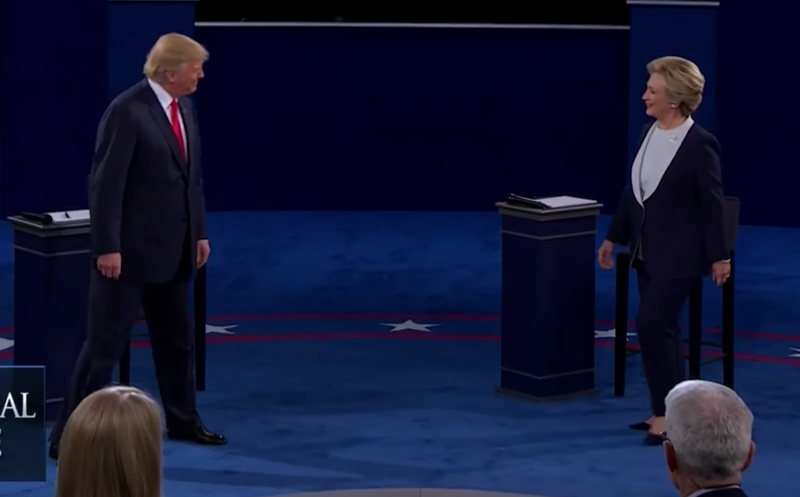 The only handshake between Donald Trump and Hillary Clinton came once the second 2016 Presidential debate was completed. 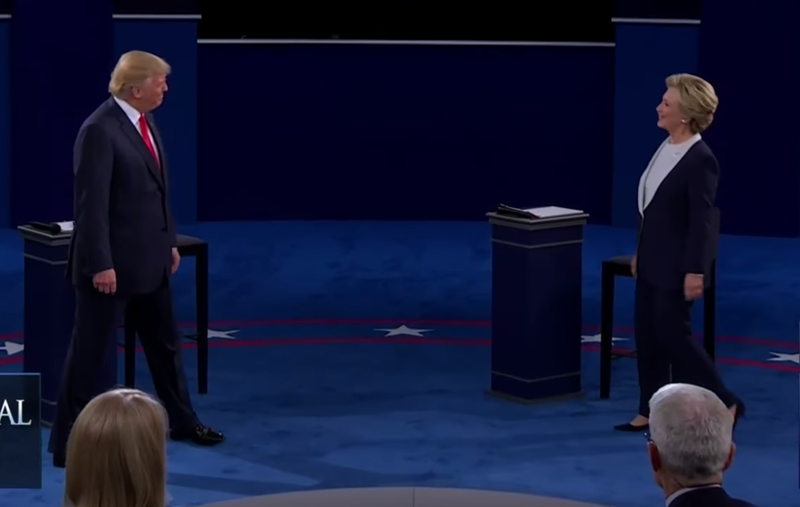 When they walked on stage, it appears that neither candidate wanted to shake their opponent's hand - and they each had this mindset prior to the debate. Donald Trump was the first to pivot toward the audience (signaling a "non-handshake" dynamic). It would have been a moment indeed if one of them had extended their hand and the other refused to shake it. 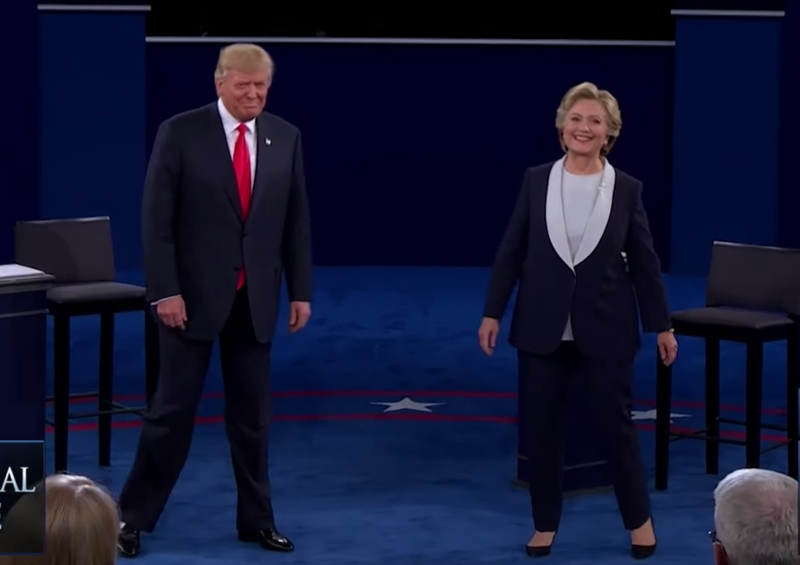 There was about 1.5 seconds (0:44 - 0:46) when Secretary Clinton did not swing her right arm while holding it slightly forward (while her left arm exhibited normal pendulum-like movement) while she was walking toward center stage - and configured her right hand just about six inches forward from the plane of her torso (appearing to be contemplating a handshake or in preparation to meet Mr. Trump's hand) - but this was not a full arm extension or a committed attempt at shaking hands. What followed was a very emotionally uncomfortable moment. 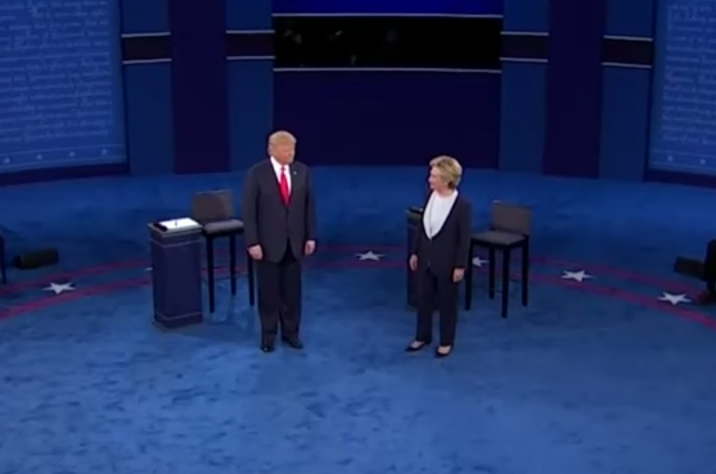 Trump and Clinton then stared at each other. 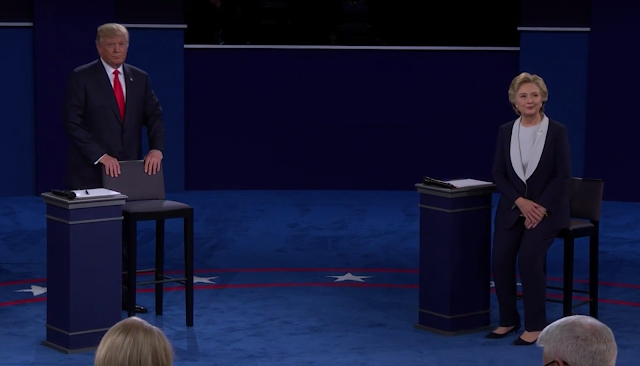 Secretary Clinton was the first to turn away. 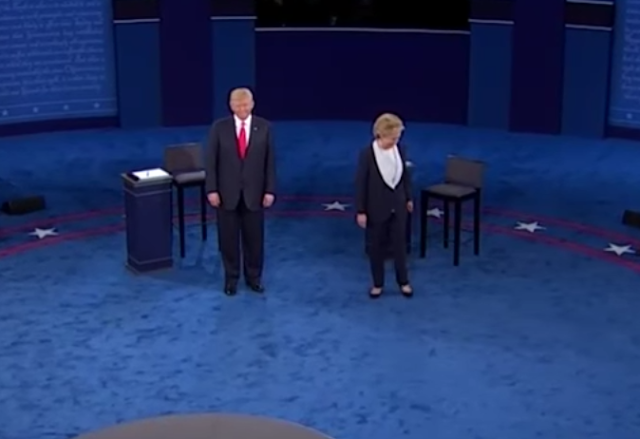 And while Clinton went to her chair - Mr. Trump walked around to the back of his chair. Here both candidates made mistakes. 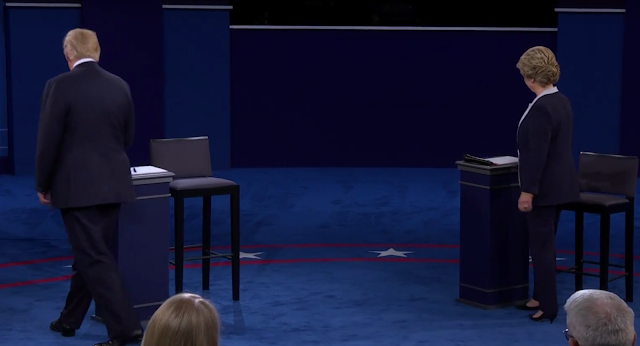 Hillary Clinton leaned back on her chair while not fully sitting down. In the setting of a presidential debate this action made her look unsure of herself, not assertive and lacking in confidence (as further evidenced as she excessively preened the lower portion of her jacket). Mr. Trump remains standing - which is a more alpha configuration, however he walks around in back of his chair - using the chair as a blocking device and insulating him from the camera, the audience and Secretary Clinton (which is considerably beta). This "feels" to him like he's standing behind a lectern/podium - a position in which he's much more emotionally comfortable. Nonverbal Communication Analysis No. 2135: Ronald Reagan in Nashua, New Hampshire - "I'm Paying for this Microphone Mr. Green!"